Cabbagehead play with Miss Moonshine on Friday, June 23, at Sonoma Cider, 44F Mill St., Healdsburg. 7:30pm. Free admission. 707.723.7018. The band began as a standard jazz sextet, formed in 2015 to complete a recital requirement for Sonoma State University's music program. It aged into a genre-bending collaboration that now garners labels like "spazz jazz" and "prog bop." The band is Cabbagehead, the North Bay's most indefinable ensemble that's quickly gaining renown for their technical skills and imaginative compositions. "We kind of go everywhere [musically]," says drummer Ricky Lomeli, who formed the group with guitarist Ab Menon, bassist Kevin Hayes, keyboardist Nate Dittle and a pair of saxophone players, Jesse Shantor on alto sax and Chaco Amazé Lechón Peckham on tenor sax. The band's inspiration for their unpredictable and motley sound can be traced back to musicians like Frank Zappa, and their technical chops allow the group to experiment wildly with arrangements and tempos. "The driving force behind this band is that it's a very open domain for us to get as weird as we want," says Lomeli. Age, recorded over a single intense weekend last July and released in February. "It was a very bonding experience to do that album," says Lomeli, "I think that, in a way, making the record pushed us to realize we wanted to keep this project going." Bookended by three vignettes, "CABB," "AGE" and "HEAD," the record features extended jams of highly energized jazz fusion that aren't afraid to dive into heavy metal breakdowns and swing with ska flourishes, and the dueling saxophones play like they're possessed by the ghost of late free-jazz pioneer Ornette Coleman. 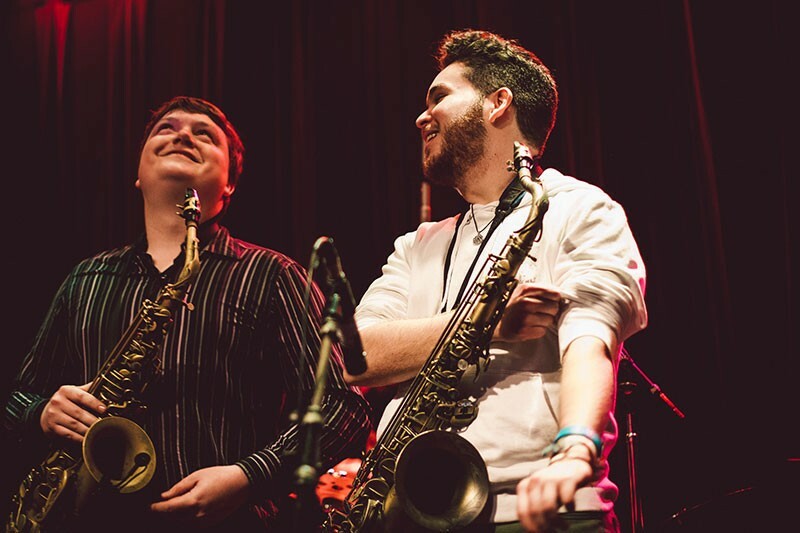 "We very much embrace that we have two saxophonists," says Lomeli. "They have such different personalities that when they play together they have a nice contrast." More puzzling than the music, though, is the name: Cabbagehead. Even the band doesn't exactly agree on what it means. Menon insists it began after he bought way too much cabbage at the grocery store. Peckham believes it to be a reference to his bushy hair style, while other members apparently have their own random theories. In any case, the group is making the most of their musical brainstorms with some of the most uniquely mind-blowing bombardments of sound in the Bay Area. "We are after the freedom to do anything," says Menon. "We'll try anything once, musically."